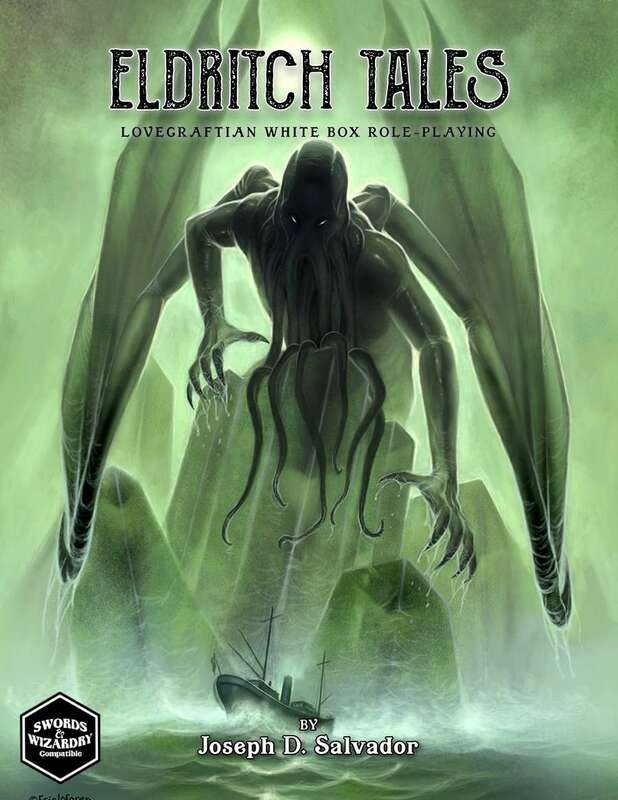 Within the pages of Eldritch Tales you will find four character classes representing many classic pulp archetypes, occupations, rules for insanity, spells, monsters, esoteric tomes, artifacts, a starting scenario, and setting material, as well as advice on using Eldritch Tales with other White Box games. This game is compatible with Swords & Wizardry White Box and other OSR games. To accomodate all devices, the PDF purchase includes versions in both high resolution and low resolution. PDF has a bookmarked Table of Contents, as well as linked terms throughout the book. Eldritch Tales offers a Compatibility License to third-party publishers interested in creating material to support the game, find it here on RPGNow or DriveThruRPG! Hmm. Well that's news. It seems to be working for me, but I'll see what I can do with it. Thanks for letting me know! Just for the record, the POD is *excellent*. Great work. Any news of the POD version? Really waiting for print version of this! I saw that several of you have asked about PoD and wanted to let you know that there have been some foreseen delays, but rint proofs have been ordered and I should have them in a few weeks. I apologize for the wait and thank you for your patience! I encourage you all to join the Eldritch Tales Fan Community on G+ to receive the latest ET news! PoD update - received the first round of proofs and submitted corrections to my layout guy. It took only 5 days for the softcover to get back to me, but 12 days for the hardcover. Any progress on making this available in POD yet? Eagerly awaiting a POD version. Fingers crossed for a hardcover. Hardcover and softcover will be available! €8.99 spent to buy this product but I don't see any character sheet! I'm very disappointed for this. Any remote possibility the file could be further optimized & compressed? Even the lo-rez version is enormous. We had a look at this and even compressing the files down to 70dpi only saves us about 3MB. The high graphic content is demanding a higher file size, but we certainly don't want to lose quality. Sorry for the inconvenience! The POD will be available alone and bundled with the pdf. In the bundle, the pdf will be steeply discounted! After learning the ins and outs of the OBS discount/coupon system, I will be able to offer a discount to early supporters like yourself! When POD drops, I will send the discount out via email!